The first class of the newly named Dental Assistant Technology Program. When the Southcentral Foundation Dental Assistant Training program began in 1991, no one imagined what the future would hold. The training was originally offered as a two-week course for students around Alaska and was held in a portable learning space outside of the old Alaska Native Medical Center hospital, without textbooks or technology, and with a focus on discussion rather than clinical experience. Despite the challenges it faced, the program persevered and graduated professionals who are still in the dental field — one is currently an administrator at SCF. In 1997, with the new Alaska Native Medical Center Dental Clinic, the program grew and 16 dental assistants completed the course. The SCF DAT Program continued to evolve over the years with defined curriculum, increased clinic time for training, new technologies to aid in learning, and additional instructors, which allowed the program to train 24 dental assistants per year. While this growth was commendable, the program recognized it could still move forward. Royann Royer, an SCF dental hygienist who has been with the program since its inception, took charge of leading the change by working to gain Commission on Dental Accreditation. CODA accredits dental schools and dental education programs across the nation and provides a national bar for education standards in the dental profession. The challenge the DAT Program faced was to receive CODA, it needed to be part of an accredited college program. The solution: Royer searched for an educational partner and found Salish Kootenai College. SKC is a small, American Indian college nestled in the Flathead Indian Reservation in Montana. Although SKC and SCF are separated by thousands of miles, they are close in ideology. 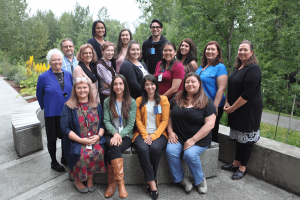 With SKC’s mission to provide postsecondary educational opportunities for Native American people while promoting community and cultural identity, and SCF’s initiative to increase the number of Alaska Native people in clinical positions, the partnership was a perfect fit. Working to create a relationship with their leadership team, Royer was able to secure an agreement that would allow SCF to be an out-of-state campus site for the college program. SCF is the first out-of-state campus site for dental assistant training in the country. It allows students to gain 52 college credits, at no cost to the students, and be trained in SCF dental clinics. Upon graduating, students earn a certificate in dental assistant technology from SKC. Graduates are eligible to take a national accreditation test to become a certified dental assistant and, if eligible, begin their careers at SCF Dental. In the 26 years that the DAT Program has existed, approximately 400 students have completed the training. Ninety-five percent of the SCF dental assisting staff began in the program, although many have advanced from a dental assistant to other positions within the department. The SKC dental assistant program also began in 1991, and has more than 750 graduates. The first SKC/SCF class of the newly named, Dental Assistant Technology Program, is currently underway.